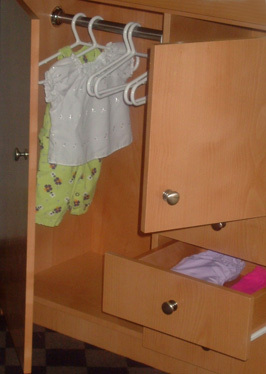 Put clothes in drawers and cupboards at a level where your child can reach and take them out for herself. It is important to put just a few suitable clothes since children feel overwhelmed and cannot make choices for themselves if there are too many options. If you make sure that you only put out the ones you are happy for her to wear then it does not matter what she chooses. You don’t mind and she is happy because she feels she has a say in the matter! To start with she may find it difficult to choose. Allow time for her to think and always go along with her choice. Soon you will find that suggesting that ‘we get dressed’ is greeted with smiles rather than a tantrum.